Things are a little erratic at Best of 3, as I work through a bunch of other commitments. One of these is reprising aspects of the talk I gave on (well,a round) Ben Cauchi's work at City Gallery earlier this year for the Photographies in Transition seminar at Massey University on August 17th. The evening before, Geoffrey Batchen will be giving the Peter Turner Memorial Lecture, this year on the topic of Anterior Futures: Photography and Dissemination. Batchen's 'Dark Sky' at the Adam Art Gallery was one of my favourite exhibition of last year, and I'm very much looking forward to his presentation. Admission: $50, (students, unwaged, $20). Registrations on the day from 9.30am. A collaboration between one of my favourite composers, Dustin O'Halloran and Adam Wiltzie under the joint name A Winged Victory For The Sullen - 'Steep Hills Of Vicodin Tears'. You can't embed it from Soundcloud, but you can download it from there. This weekend at Gather I took our well-worn reading recommendations session out for another spin. Here's the list the ~40 people who came to the session recommended. Last week, in my role as a member of the Creative Commons Aotearoa New Zealand advisory panel, I took part in two gigs. On Tuesday night, along with Victoria Leachman from Te Papa, Mark Crookston from the National Library and Brenda Leuwenberg from NZ on Air, I was part of a panel talking about open heritage and culture at Nethui. Following that, CCANZ's public lead Matt McGregor and I recorded a short piece with Lynn Freeman for Arts on Sunday on copyright and what it means for the creative sector. You can listen to the audio above. To learn more about Creative Commons, head over to the website: Matt is also very happy to run workshops in workplaces, schools and universities to explain how you can release your work for creative reuse, while still maintaining the level of control you desire. And for an interesting insight into how CC licences should - and sometimes don't - work, check out Sage Ross's piece on how his CC-licenced photos of Aaron Swartz were picked up and used by the media following the internet activist's death this year. Over the past year, I've rediscovered music. I've returned to hip hop after an absence of nearly half a lifetime, I've been overjoyed to see the resurgence of R&B, I've developed a new taste in Scandi pop, and I've got long playlists with titles like 'Elevator dancing', 'Sad-eyed boys' and 'Romantic minimalism'. I get most of my new music from two blogs that I follow - Pretty Much Amazing and Line of Best Fit - and I've become very fond of the idiosyncratic writing style of the contributors, who clearly work very fast and as a result often write in Tyrianly purple shades of prose. This year, as well as sharing what I've been listening to through regular high rotate posts, I've been collecting some of my favourite phrases from these write-ups using Storify - I tweet the bits that catch my ear and then usually throw in a link to the tracks occasioned them. Here's where I'm at now. Sailor & I 'Tough Love'. I'm obsessed by how his autotuned and natural voice seem to twine together here. The title track from Phantom's debut EP, 'Scars'. Atmospheric and cloudy. And, okay, okay. One upbeat tune to pull your day back together. The Preatures' 'Is This How You Feel?'. You're welcome. *The best music to listen to when feeling sad is Scandi pop. Fact. 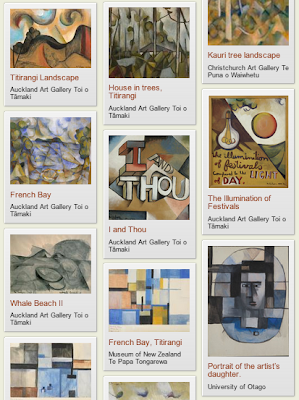 Today on the radio I'll be talking about painter Ian Scott, who died on June 27th; the Moana - My Ocean exhibition at Auckland Museum; and rumours (firm rumours) that Amazon will be partnering soon with dealer galleries. A week or so ago, I read an article about Accurat's 'Visualising painters' lives' project. The very detailed infographics (or, really, great big wallpapers - I'm still dicey about a lot of this infographic stuff) take the events and creations from ten 20th century painters' lives and attempts to depict them using visual motifs drawn from each painter's work. I stopped watching the video half-way through, to be honest. It felt unnecessarily complex, and I couldn't keep up. But it got me thinking about how essays and biographies might be illustrated at room-size. As always, I turned first to McCahon. How might a wall look, mapped out with his works against his various travels, homes, relationships, influences, and world events? Like an illustrated appendix writ large and - more importantly - as a journey, an object to walk by. It's not as simple as colourful first, khaki in the middle, and black and white at the end (especially as DigitalNZ only contains works from those New Zealand's public collections who are content partners, and private and corporate collections aren't represented here). I'm actually not sure that there are patterns to be seen, and I was constantly surprised along the way (these two works from 1958, for example, feel much later; the North Otagos of the late 1960s meanwhile feel much earlier). Still, it was an interesting exercise, and made me wonder what would happen if you ran every work from the McCahon database through a colour abstractor (having pulled out the sketches and prep drawings first) and then laid those out chronologically. Does it say anything about the work, or the painter's life? *The ordering of the images is a little wonky, due to metadata oddities. I checked dates whenever things felt tangibly wrong to me, but please don't expect my chronology to be 100% accurate. Just try getting M.I.A. 's d-d-d-d-dem-d-d-d-d-freedem out of your head after listening to 'Bring the Noize' (and enjoy the all-gold version of the music video while you're at it). I feel conflicted about this whole question. On the one hand, it drives me nuts that the ethical rules around deaccessioning force museums to protect objects in a way we do not comparably protect other core aspects of our work. There is no requirement that if you cut an educational program that you have to use the funds saved from that to fund other educational experiences. I've worked with museums that have hefty collections and restricted acquisition funds but are closed to the public because all of their dollars and assets are wrapped up in objects and none in public service or access. I can also see the argument that it actually makes museums MORE relevant if our assets are considered fair game in a situation like Detroit's--just as important and just as endangered as other core services. Shark cam from flight404 on Vimeo. Pretty quickly, I got a good looking swimming tuna but then right down the rabbit hole I went. Robert Hodgin's write-up of making an animation of a marine boil-up (an underwater tornado-shaped feeding frenzy) is one of the best things I've read in ages. He captures not only the effect he was aiming for, and the lengths and compromises he had to go to to try to achieve that, but also the nervousness of working at a distance for a client (Auckland Museum, for their recently opened Moana exhibition) you don't have direct contact with. It's a beautiful piece of work, even if you don't know what flocking logic, Cinder C++ or multithreading are. Highly recommended.